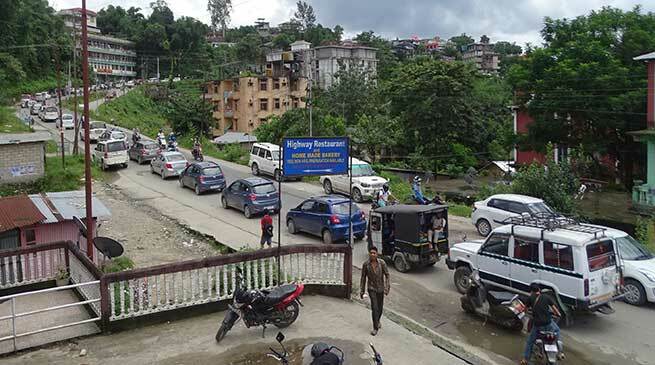 The people of the state capital, Itanagar experienced biggest traffic jam of the year. The traffic jam of Itanagar was a horrible as it was at snail’s pace on the NH-415 which was experienced by hundreds of commuters today. One commuter Dipak said that I have to go to Ganga Market to board a trekker for Naharlagun and coming from Gohpur Tinali on walking while my brother is still to reach Ganga who is coming in car, so horrible situation have come in state capital, One Tamo who was driving a Bollero said that what a time have come for us, I have to leave up my car and buy a motorcycle to move around the roads of twin capital city. It was really an embarrassment situation as the cue of vehicle on NH-415 from Ganga Market to Gohpur Tinali covering a distance of more than three KM was jam. Few of them said the main road is blocked and restoration is on while the Itanagar Papu Nallah via Jully bypass road is in pathetic condition what will happen to this state capital.